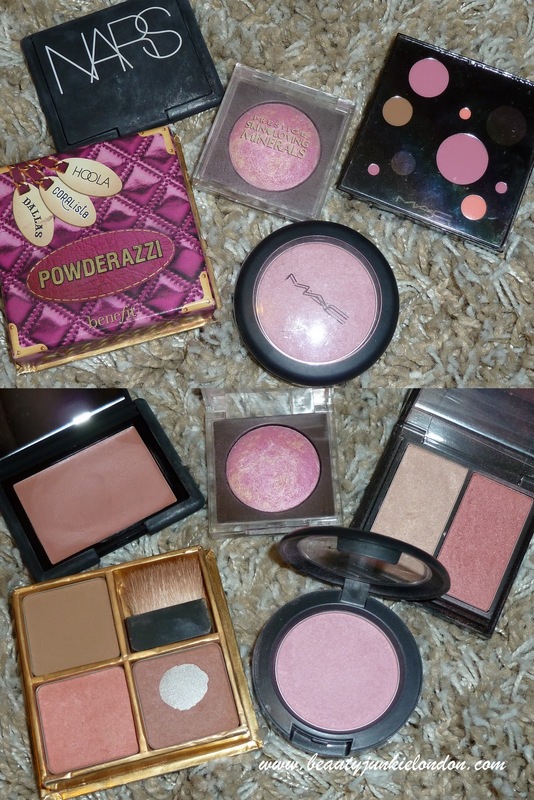 I thought I would start doing a few posts on some of my favourite products, starting with blushers. I adore blushers, one of my favourite pieces of make-up (mascara is my no.1 fave) but blusher would be in my top three essential make-up products. My five favourites are somewhat typical of the beauty blogging world, many familiar names. What can I say – I’m predictable… and they are classics. Benefit Coralista – a gorgeous coral blush (duh, clue in the name…) that has just enough of a sheen to make cheeks look all glowy. Nars Pennylane – I blogged about this a while ago, but it really is a gorgeous pretty pink cream. Another one that has just enough sheen for a glow. Love using this as a base for blush to make a powder blush stick and last a bit longer. MAC Well Dressed – probably the most well known MAC blusher out there. Bright pink, almost a little scary looking in the pan, but on the skin it’s a gorgeous healthy flush of colour. Prestige Baked Mineral Blush in ‘Pink’ – this is similar to Well Dressed when swatched, but has a slightly stronger shimmer and ever so slightly warmer. MAC Peachykeen – I got this in one of the Xmas palettes from last year (for cheap at the Bicester Village CCO) this is the warmest colour of the five, another one with shimmer (did you spot the theme yet…) but slightly better for cooler months as this shade is a bit more ‘cold weather healthy flush’ than ‘warmed by the sun flush’. So there we have my favourites – now tell me yours! All bought my myself other than the Prestige which was sent for review. I totally agree with the NARS Pennylane. The Prestige and Coralista are some of my favourites too. I like the look of Peachykeen as well. look slike oyu love some dallas too 🙂 i love that powderazzi palette, it’s really handy and i love all 3 colours that come with it! @Patricia – I do indeed! I’ll be including that one again as my favourite bronzer 🙂 I love the powderazzi set – was such a bargain, got it for £18 in Jan for the ASOS sale! Coralista is a gorgeous blush, probably the one I reach for most often. I’ll buy again when it runs out.